Greetings from Southern Illinois. I love this time of year. Everything outside has been growing by leaps. Green leaves are sprouting everywhere. I have started my annual tomato garden project. Some years it turns out very well and some years not so good. Last year the “critters” ate everything. Not only the tomatoes, but the leaves and the vines too. This year there will be a fence around my little garden, so I am hoping for better results. Right now I have my small plants—still in their paper cups—sitting on an aluminum tray. I take them outside in the daytime and bring them inside at night. Conventional wisdom, in these parts, says to plant them on May first when the possibility of frost has passed. Rick McMichael of Preferred Wireless thinks I have a secret for growing great tomatoes. Don't tell him, but I just use Miracle-Gro® Tomato Plant Food. Will Rogers, who died in a 1935 plane crash, was one of the greatest political sages this country has ever known. "Long ago, when men cursed and beat the ground with sticks, it was called witchcraft. Today it's called golf." If you missed the great video last week, Why Nothing Beats Paging For Critical Messaging, here is a link to see it on YouTube. I found a free e-book from MissionCritical Communications about narrowbanding that you might find interesting. False information spread fast the night of the Stanley Cup riot. Rumours about street, bridge, and train-station closings only added to the chaos, as downtown Vancouver was besieged by violence and looting. In their riot review, John Furlong and Douglas Keefe said there was no reliable place to go for accurate information that night. They urged local officials to find a way to disseminate such information in times of crisis. One way of doing this, the co-authors wrote, would be by using cell broadcast technology. It would allow messages to be sent to all mobile phones connected to specific cell towers. While the United States recently introduced such a system, it remains years away in Canada. So now that the hometown Canucks have begun another quest for the Stanley Cup, if trouble does again break out on Vancouver streets emergency officials say they’ll turn to Twitter to try to ensure public safety. “The important thing that the riot review referred to was that there was inaccurate information [on June 15],” said David Guscott, chief executive officer of E-Comm, the emergency communications centre for southwest B.C. Mr. Guscott said every tweet sent out by E-Comm, Vancouver police, the city and TransLink will be verified information. He said the parties will work together at E-Comm and noted they have more than 60,000 Twitter followers combined. The city announced last month that Stanley Cup playoff celebrations would be decentralized, and only take effect if the team reaches the third round of the playoffs. Mr. Guscott said E-Comm plans to follow a similar timeframe. Mr. Guscott said it could be years before cell broadcast technology is utilized in this country, as it would require federal legislation. He said several factors must be taken into account, such as who will be authorized to send messages, plus costs. He said such a system could be used in B.C. for far more than riots and pointed to wildfires, floods, and earthquakes. Editorial Opinion pieces present only the opinions of the author. They do not necessarily reflect the views of any of advertisers or supporters. 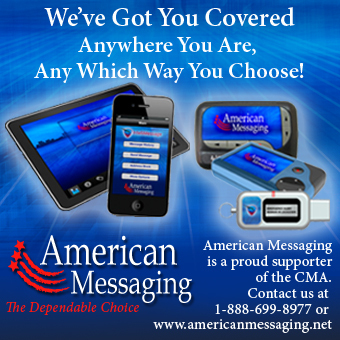 Please help support the Wireless Messaging News by clicking on the PayPal Donate button above. If you would like to have information about advertising in this newsletter, please click here. If you are reading this, your potential customers are probably reading it as well. Many municipalities provide vehicle parking facilities using “Multi-Space” Payment Kiosks installed a short distance from up to several dozen numerically identified parking spots. Most current Multi-Space Payment Kiosks accept payment via cash or credit card. Call2Park is a coin-less payment system that can be added to Multi-Space Payment Stations to permit vehicle parking fees to be paid via a simple cell phone call as an alternative to the use of cash, credit cards or tokens. Tens of thousands of these Multi-Space Payment Kiosks are currently operational in major cities and this number is certain to grow exponentially over the next several years. The designers of the Call2Park system are now seeking partners to share in the opportunity presented by this new application. For more details contact Ron Mercer at WirelessPlannerRon@gmail.com or by telephone at 631-266-2604. Thanks to our speakers, sponsors, and participants at the Critical Messaging Convention for making the event an enormous success. 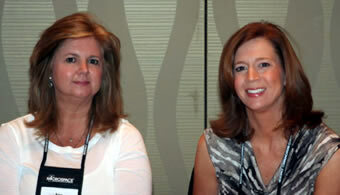 Many remarked that the educational sessions and networking opportunities exceeded expectations. 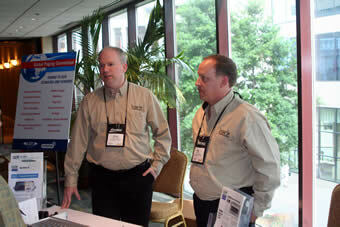 Conference presentations that were received are available on the members-only page. Essentially half of U.S. mobile subscribers are now downloading applications and using the browsers on their mobile phones, and their usage of these features is increasing at a fast pace. In its most recent quarterly survey ending February 2012, comScore found that 49.5 percent of mobile subscribers used downloaded applications, up 4.6 percentage points from the previous quarter. Browsers were used by 49.2 percent, up 4.8 percentage points. The firm also noted that Google's ( NASDAQ:GOOG ) Android continues to grow its share in the U.S. smartphone platform market. It crossed the 50 percentage threshold to capture a majority share for the first time. ComScore's mobile content usage, three month average ending Feb. 2012 vs. three month average ending Nov. 2011. 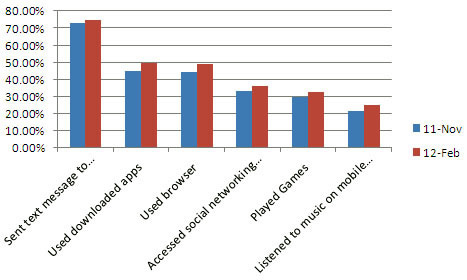 ABI Research, in a separate study, projected that mobile users worldwide will download nearly 36 billion apps in 2012. Android and the Apple ( NASDAQ:APPL ) iOS will take 83 percent of that market and Windows Phone will get just 2 percent . The firm noted the Windows Phone has entered the market from scratch and expects its next-generation Windows Phone OS and Windows 8 tablets should give it a boost. Developers do like working with Windows Phone and even if the platform does not become mainstream, ABI believes it can still offer a vibrant app market for developers. The Telephone Consumer Protection Act (“TCPA”) places limits on unsolicited prerecorded telemarketing calls to landline home telephones, and all autodialed or prerecorded calls to wireless numbers, emergency numbers, and patient rooms at health care facilities. These calls are known as “robocalls.” The FCC recently took steps to further restrict robocalls with new rules that will go into effect after they are approved by the Office of Management and Budget (approval will be announced in the Federal Register). This Consumer Guide describes how the FCC’s rules will change, those rules that will continue unchanged that also provide consumer protections, and how you can best avoid unwanted telephone calls. When the FCC’s new rules go into effect, they will impose clearer requirements for how a business must obtain your consent before it may make a telemarketing call or send a telemarketing text message to you. The new rules will require that you first give your written consent to receive such calls or messages, on paper or through electronic means, including website forms, a telephone keypress, or a recording of your oral consent. Another change is that telemarketers will no longer be able to make telemarketing robocalls or send texts to you based solely on an “established business relationship” with you. You may establish such a relationship when you contact a business to ask questions or purchase something from a business. The new rules will also require telemarketers to allow you to opt out of receiving additional telemarketing robocalls immediately during a robocall through an automated menu. This new requirement means that you will not have to hang up and make a separate call in order to stop further telemarketing robocalls. There is no change to the prior consent requirement for robocalls and texts that are not telemarketing. These include messages regarding school closings or those containing flight information. You do not have to give your consent for these calls to your landline home phone. However, your oral or written consent is still required for these types of calls or texts made to your wireless number. Under the TCPA, the FCC, along with the Federal Trade Commission (FTC), established a national Do-Not-Call list. Placing your home or personal wireless number on the list prohibits telemarketers from calling, unless you have given them your prior expressed permission to call, they are exempt from the rules, or they have an established business relationship with you (an exception that will be changed by the new rules). To register a number, go to www.donotcall.gov. If you think there has been a violation of the robocalls rules, you can file a complaint with the FCC at https://esupport.fcc.gov/ccmsforms/form1088.action?form_type=1088C . While the FCC cannot award monetary or other damages to consumers, filing complaints allows the Commission to investigate violators. However, in some states you are allowed to file suits against telemarketers and receive monetary damages for violations of these rules. 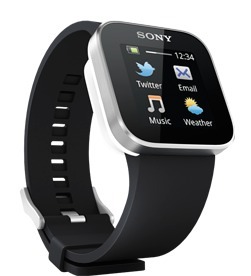 Summary: Sony’s SmartWatch shows that wearable electronics aren't quite ready for primetime. But while the concept of a “smart watch” seems glitzy and futuristic and interesting, its implementation so far in devices like Motorola’s Motoactv has had some pretty fatal flaws. And you can also see them fairly clearly with the aptly-named SmartWatch, Sony’s most recent stab at the concept that’s now hitting the U.S. The biggest issue is that the SmartWatch isn’t actually designed to work independently of a smartphone, which to me is 90% of the reason why the thing is effectively useless. Sony’s defense is that the strategy makes sense because, well, people have their phones on them all the time anyway. That logic would be sound and understandable if the Smartwatch ran $50 or so. But it doesn’t; it costs $150. Yeah, $150. That, along with the device’s total and utter dependence on a smartphone will effectively cosign the SmartWatch into oblivion pretty rapidly. Which is sad, really, because I’m honestly and earnestly excited for a day where wearable electronics like smartwatches and HUDs are present inextricably in the mainstream currents of society. Unfortunately, as the SmartWatch all too sadly shows, that day is still a bit far off. The Commercial Mobile Alerting System, a national alert system that sends emergency messages to mobile phones, is officially live, although it will be a while before many phones are able to receive the alerts. CMAS, which has been in the works for a few years, can send text-based messages to people’s phones in geographically targeted areas. It requires no subscription, and there are no charges for the messages. A joint project of the Federal Emergency Management Agency, the Federal Communications Commission and wireless carriers, it uses SMS-Cell Broadcast technology (a one-to-many service, as opposed to point-to-point services) in order to avoid backlogs when wireless voice and data services get taxed in an emergency, FEMA said. CMAS is part of the broader Integrated Public Alert and Warning System, which is intended to integrate communications channels, including cellular, satellite and the Internet, into a far-reaching alert network. It complements the venerable and recently upgraded Emergency Alert System (EAS), which delivers warnings via TV and radio transmissions using broadcast, cable, satellite and wire-line platforms. FEMA expects that most alerts will be weather-related and will be issued by the National Oceanic and Atmospheric Administration’s National Weather Service but emphasized that the system will only be used for the most serious events, be they weather conditions such as hurricanes and tornadoes or other emergencies. The service will be used for Amber alerts concerning abducted children, Imminent Threat alerts involving potential terrorist activity, and Presidential alerts involving natural disasters, terrorism and other emergencies. For example, state and local officials who want to be able to send Imminent Threat alerts must complete a four-step application process and then ensure that their alerts meet FCC criteria for severity. Hundreds of wireless carriers, including all the major providers, are participating in CMAS, but FEMA says it will take some before all infrastructure and devices are upgraded to handle the alerts. Not all mobile devices are capable of receiving CMAS/WEA messages, FEMA said, but some existing phones could be upgradeable and carriers are now selling phones with the capability. Although the alerts will carry messages written in text, they differ from traditional Short Message Service text messages in that they will pop up on a user’s phone automatically, rather than having to be opened. Alerts will use a unique ringtone and vibration to differentiate themselves from other messages or calls, but won’t pre-empt calls in progress, FEMA said. Messages will be limited to 90 characters, so they’ll contain only basic information about an emergency, along with recommended actions. There are no charges associated with the alerts, either to people or government agencies. And although the system will send messages to every capable device in a specified geographic area, people can opt out of receiving Imminent Threat and Amber alerts, but not Presidential alerts. And because SMS-Cell Broadcast is a one-way technology, FEMA said, CMAS cannot track the phones receiving its messages or collect any data from a users’ phone. The Multitone WP pager is waterproof and POGSAG (Post Office Code Standardization Advisory Group) standard, with up to 4000 hours of standard battery life. Boasting simplicity, functionality and a practical design, the Multitone WP pager is inexpensive and features robust construction ensuring it will continue to function correctly in wet conditions (IP67 rated and tested in water up to 1m deep), is subjected to large quantities of dust, or gets dropped. Easily integrated into a new or existing communications infrastructure, the Multitone WP pager can be programmed with multiple profiles to suit varying groups or teams, to fit in with specific work patterns and requirements. 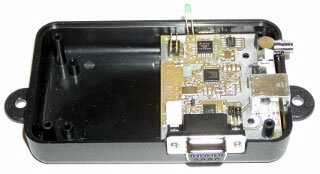 Programming and management of the Multitone WP pager is simply achieved by linking it up to a computer via a standard USB cable which links to the pager cradle. 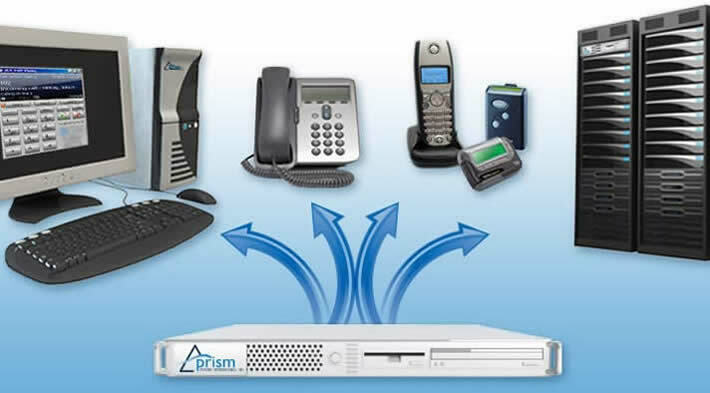 Users and work groups are defined, standard messages can be pre-programmed and up to fourteen different tones can be specified to give an instant audible meaning to an alert. The Multitone Firecoder has been designed to meet the requirements of emergency service stations (both for fulltime and retained crews) and is highly flexible, delivering solutions pertinent to any authority with respect to software and hardware configuration. The software is accredited to the Home Office protocol GD92 version GD92/1003A/2.2 and is “closed loop” thus ensuring secure message delivery and an audit trail. The software also supports the Home Office specification MG4 for fire-fighter alerting. 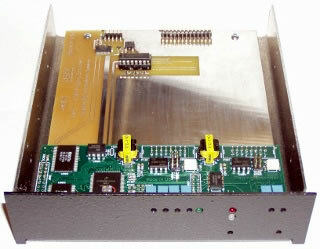 In addition to system messages, the unit can deliver “unsolicited” messages to a GD92 network manager. 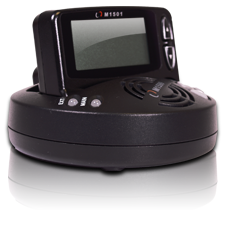 This gives the system a degree of self-monitoring, essential for an emergency service, with remote diagnostics and configuration. A new phenom is hitting the enterprise known as Bring Your Own Device (BYOD) and it will have a huge impact on our jobs in the next five years. BYOD sounds simple: let employees choose their own devices and software and let them use their personal devices like smartphones and tablets, too. What's wrong with that? If I want to use my own iPad or smartphone for work — and I paid for it — my company should be jumping for joy, right? Not exactly. IT needs to protect the company's network from viruses and to protect sensitive data from being lost or stolen. Most companies have a legal obligation to protect this stuff. And your iPad is a threat because it can be lost or stolen. It happens all the time. Last month, an iPad that belonged to a hospital worker was taken from the worker's car. It contained names, addresses and test results of patients. The hospital issued letters warning patients and had to explain why employees were running around with patient data on unsecured devices. I don't work for a hospital, so how can that kind of thing apply to me? This is a universal problem because employees are starting to use their own devices for work in record numbers. Forrester Research estimates that 21 million office workers are using their own smartphone for work. Some 11 million are buying their own work laptops and 3 million bought tablets for work. The IT department can't always see those devices and what data is stored on it. They don't know what files will wind up on Dropbox or other cloud services. Should companies simply forbid people to use their own devices? Those days are gone. Today's workforce is full of people who have been raised on technology. They wouldn't let IT choose their tech for them anymore than they would let IT choose their food. A company may still pay for devices, but might let users choose from a longer list of options. This means that IT has to support a wider range of devices if they break, and to keep them patched and updated so the bad guys can't hack them. IT also needs to buy mobile device management software which tracks devices, encrypts them, locks them and can sometimes wipe data from them remotely if they are lost or stolen. This software is available from big vendors like IBM or Sybase and smaller ones like Zenprise, AirWatch (and lots of others). This isn't perfect either. Employees would have agree to install it on personal devices used for work. A rock and a hard place? Can't we do better than that? Yes, especially over time. Enterprises can opt to deliver all of their software over a cloud connection so nothing gets stored on the device. It's a concept called desktop virtualization or virtual desktop infrastructure. VDI has traditionally been slow, clunky and expensive to use, especially for Windows. But new technologies are arriving that will make them better (like Cloud Paging ). HTML5 is also coming. This is the next generation for Web pages. It delivers rich, multimedia applications in the browser. More and more apps will run in the browser. Users can access them from any device. Eventually, the IT department will be very different than it is today. It will be like a personal corporate app store. Employees will be able to choose which apps they want to use for their jobs from a list that IT provides and on any device they want. Employees will create their own "personal clouds" on their devices ... all their work and non-work apps accessed from one device, most of it stored in the cloud, with IT in control of the ones used for work but maybe not the device itself or the other apps. Within the next five years a new crop of devices will arise that help , too. Forrester analyst Frank Gillett calls these "frames." They will be smart devices that can take voice and gestures commands and will act as a bridge between our personal devices and our personal clouds. London, 11 April, 2012 — PageOne Communications , the UK's leading provider of mobile messaging solutions to the public and enterprise sectors, today announced it will be exhibiting at British APCO 2012 alongside its two-way paging partner Swissphone. Two-way paging has seen an increase in demand across the public sector and emergency services, highlighting the growing desire for technology that can offer its users both cost and efficiency savings whilst improving the management of resources. Representatives from PageOne and Swissphone will be available at the conference to advise organisations on getting the greatest performance and value from their critical messaging. PageOne will also be offering a preview into an exciting new development taking place — the news that dual frequency scanning will be available in the UK for the first time from PageOne. Once launched, this unique solution will provide a cost-effective option for organisations looking to improve the robustness of their operational and incident management processes. 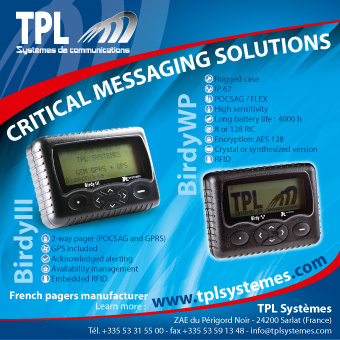 By simultaneously monitoring for critical messages over two channels (both on-site and wide-area), dual frequency paging can ensure widespread reach and resilience without the need to maintain extensive on-site paging systems where wide area paging coverage is already available. For example, many organisations currently operate an on-site local transmitter network in addition to using the PageOne wide area network. 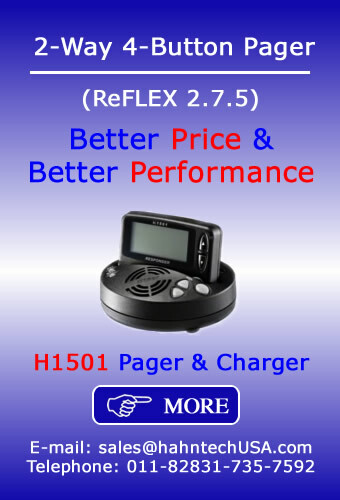 A dual frequency pager will continually monitor both channels, decoding the message from whichever is currently displaying the strongest signal. "Dual frequency deployment allows the coverage to be combined between the two paging networks and leverages the synergies of commercial wide area paging," said Chris Jones, CEO of PageOne. "With the pressure on for organisations to do more with less, considerable savings can be made while at the same time delivering increased resilience". PageOne Communications is celebrating 25 years of innovation in mobile messaging solutions. The company has proven expertise in helping clients drive operational and cost efficiencies, deliver effective results and have a real business edge in a competitive market. With a rich heritage in all aspects of messaging — from paging and SMS through to voice, email and location based services — it places its customers at the heart of its product development to help thousands of organisations across the public and major corporate sectors with reliable, cost-effective and award-winning solutions. Implement a database to prevent use of stolen smartphones. Within six months, when Americans call their participating wireless provider and report their wireless devices stolen, their provider will block that device from being used again. This system will be rolling out globally using common databases across carriers over the next 18 months. Encourage users to lock their phones with pass-words. Smartphone makers will notify and educate users in the most highly visible ways—through messages on the smartphone itself and through “Quick Start” user guides—about how to use passwords to deter theft and protect their data. Educate users on lock/locate/wipe applications. Wireless providers will directly inform their customers about how to find and use applications that enable customers to lock/locate/and wipe smartphones remotely. Public education campaign on how to protect your smartphone and yourself. The wireless industry will launch a campaign, with media buys, to educate consumers on how to protect their smartphones and themselves from crime. Progress benchmarks and ongoing dialog. The wireless industry will publish quarterly updates and submit them to the FCC on progress on these initiatives. The FCC will engage the public safety community and wireless carriers in an ongoing dialog, with regular, quarterly meetings, to ensure that the most effective technological processes are in place to deter smartphone theft and data exposure. The FCC will launch a proceeding if progress on the above deliverables falls behind schedule. Members of Congress are planning to introduce legislation that will make it a federal crime to take steps to evade the effective deployment of a stolen phone database, including by tampering with hardware identifiers on wireless devices. 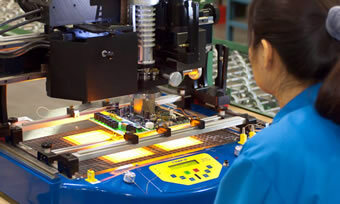 Criminalizing tampering with unique hardware identifiers has been an integral part of successful foreign deployments of stolen cell phone databases and the deterrence of cell phone theft. GRASSLEY CONTINUES HOLD ON FCC NOMINEES: Sen. Charles Grassley (R-Iowa) does not intend to lift his hold on the nominations of Ajit Pai and Jessica Rosenworcel to the FCC. Grassley placed the hold because the FCC refused to release documents related to LightSquared, which he is investigating. The Commission said they had declined to provide Grassley with documents because he is not a member of committee that has jurisdiction over the FCC. Last month, the FCC provided documents to the House Energy and Commerce Committee, which, in turn, shared them with the Senator. Grassley, however, was not satisfied, stating that these documents had been previously released in response to a Freedom of Information Act request. Hence, he did not believe there was anything new, and the hold remains on the FCC nominees, according to his office. To mark the 100th anniversary of the sinking of the Titanic, the BBC's Sean Coughlan narrates one of the most authentic versions of events in existence. Using voice synthesis to re-create the strange, twitter-like, mechanical brevity of the original Morse code, this programme brings to life the tragedy through the ears of the wireless operators in the area that night. On the night of the disaster, the network of young Marconi wireless operators on different ships and land stations frantically communicated with each other across the cold expanses of the North Atlantic in an effort to mount a rescue for the doomed vessel. All these messages were recorded at the time in copper-plate handwriting, now scattered across the world in different collections, but together forming a unique archive. Very informative newsletter this week, and I must say that your comments about not having to apologize for bring a Christian were the highlight of the whole document. Thanks for that and have a great and happy Easter. Added: Jerry is a paging systems engineer with an MSEE, also a very good friend. 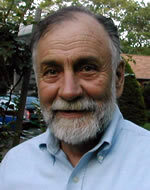 He was the leader of the systems engineering team that reported to me when I worked at Motorola.